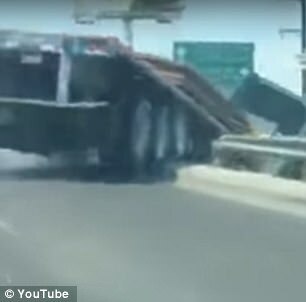 This is the shocking moment that a road rage incident between a pair of truckers turned into a full-scale disaster, causing one of the vehicles to plunge off a bridge. 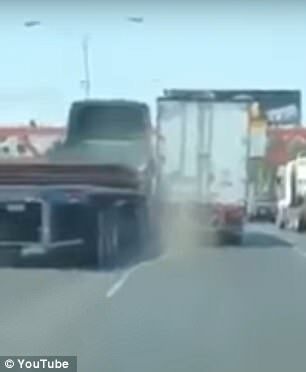 The video, filmed in the Mexican city of San Nicolás de los Garza in Nuevo Leon state on Thursday, shows two trucks jostling for supremacy on Manuel L Barragan Avenue. Their feud escalates to dangerous levels as they approach an overpass – and ends in spectacular catastrophe, Mundo Hispanico reported. 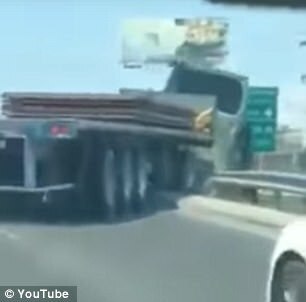 The video, filmed from a car behind the two trucks, shows a flatbed semi carrying metal sheets attempting to drive around another truck and failing. 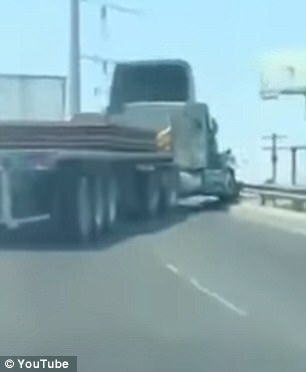 Eventually, the driver of the flatbed apparently becomes so enraged that he begins to strike the back of the other truck with his vehicle. That causes large clouds of burned rubber or dust to rise up behind the two vehicles, creating a dangerous environment for those behind. But still the truck in front refuses to budge – so the flatbed pulls back and attempts to undertake on the right-hand side. Unfortunately, the driver is apparently so blinded by fury that they misjudge the angle and instead veer off sharply to the right, plowing through a support railing and off the overpass. Miraculously, there were no injuries reported in the shocking crash, which occurred at the highest point of the overpass.